The proboscis monkey is found on the island of Borneo in South East Asia. It has one of the most unusual appearances of monkeys in its family (Cercopithecidae) because of the large protruding nose that males possess. It is believed that males possess these large noses to enable enhanced vocalizations (through resonance) when trying to impress potential mates. Female noses are smaller than males. 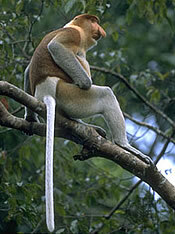 Proboscis monkeys can weigh up to 48.4 lbs and can reach up to 27.6 inches in head and body length. They also have noticeable large, bloated looking bellies because of their diet. Males are larger than females. The coat of the proboscis monkey is pink to light brown in color with red on both the head and shoulders. The limbs and tail are gray, and there are cream patches on the throat. These monkeys are excellent climbers and good swimmers and have partial webbing on their feet. Proboscis monkeys can be found on the coastal mangrove, swamps, and riverine forests of Borneo which contain forest, dry land, shallow water (for wading), and deep water (for swimming). They can be found in small groups of five, consisting of one male and the rest female, and they prefer to remain in trees throughout most of the day. Larger groups of 10 to 32 have been observed called "troops" which consists of several groups joining together, and they are very noisy with males displaying to each other and often crashing through the tree branches. Diet consists of young leaves, seeds, and flowers. Mating occurs from February to November, and females give birth to one young after a gestation period of six months. 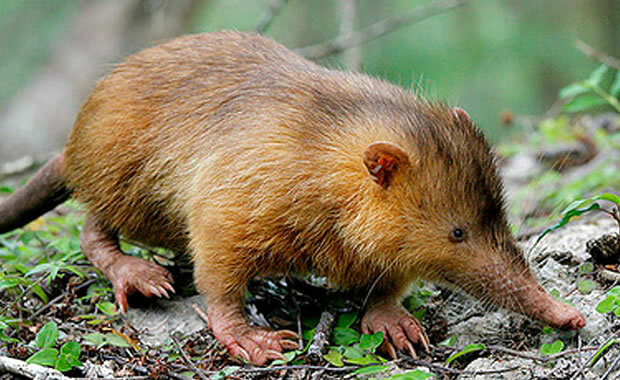 The main threat to the species is habitat loss due to land clearing for plantations and logging. They are also hunted and captured although they are legally protected. There are an estimated 7000 individuals left in Borneo. The Sarawak population is down to 1000 as of 2006 (down from 6500 in 1977). Some proboscis monkeys can be found in several protected areas, such as the Kinabatangan Wildlife Sanctuary. Copyright Notice: This article is licensed under the GNU Free Documentation License. It uses material from the Wikipedia article "Proboscis monkey". Glenn, C. R. 2006. "Earth's Endangered Creatures - Proboscis Monkey Facts" (Online). Accessed 4/23/2019 at http://earthsendangered.com/profile.asp?sp=278&ID=3. Need more Proboscis Monkey facts?